The burning question this week is possibly not: ‘What did it feel like to win a 12kg cake at the Ceri Hand Gallery’s Summer Fete?” But that’s what this post is about. Reader, it felt good. This blogger got a round of applause for a dubious and hitherto untried skill of guessing the weight of baked items. Plus, a tasty cake. 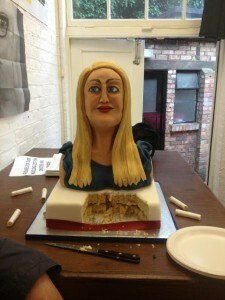 The Victoria sponge took the form of a bust of the eponymous gallery director. It didn’t look too much like Ceri Hand. But it did look folky enough for the spirit of the occasion. Artist Dominic from Luton (of more here) drummed up plenty of entries. You might not think the bakers he used get too many portrait requests. But still the eyes followed you around . . .
With a 60 mile train journey back to Brighton, an instant division of spoils seemed in order. Impossible to eat one’s way through so much cake at home, not with those eyes. But the afternoon event was a lot of fun. Another highlight was a tarot reading by John Walter. Got up like an exploded rug factory he dealt out 9 resonant cards. Nearby Alice and Jasmine from the Glossary of Gestures for Critical Discussion (+ Rachel and Gareth from MoreUtopia) were on hand, pun intended, to talk about their amazng tumblr feed. There was plenty more to see. In fact, artist Helena Hunter’s eyes were popping out on springs. Her deadpan dance performance, with joke shop accessory, said it all in a way. But the festival had its darker side. Outside the venue Robert Foster spent the entire afternoon in the stocks. His alleged crime: forgery and impersonation. Endurance is surely one of the most valuable qualities in art and this much-abused artist had plenty, with fish, tomatoes and eggs bouncing off his cranium all afternoon long. Finally, there was a dangerous combination of cheap beer and desirable works for sale. At least one was bought by a genuine local, who came back for cake. Now that’s a summer fete! For a fuller account of the day, you should read Ceri Hand’s round up of everything which took place, including an awesome-sounding fish battle. Read on.